On May 24th 2018 the Town of Newmarket was able to accept and approve all above ground and underground works by the developer Landmark Residential Subdivision Phase 2 and 3. This was after all engineering obligations and all maintenance requirements were met. You may be aware that is has been something the town staff and I have been working on for the last three years. My vision is to have complete communities and I will continue to push to ensure the final two phases are completed at a productive pace while keeping our homes clean, safe and comfortable. For Rannie Road and Ritas Avenue now that we own the roads we have taken responsibility for them. This gives us the authority to do some engineering upgrades and enforcement. The following is a schedule of upgrades that will occur. 1. Speed Management: The Town of Newmarket uses radar speed boards as part of our Speed Management Program. When a vehicle approaches one of these signs, the digital display will come to life, showing the driver heir speed. If the driver's speed is greater than the posted speed limit for that street, the display will start to flash, reminding the driver to rethink their speed and slow down. In 2017, Newmarket expanded its radar board program by acquiring 7 new radar boards. These new radar boards are powered by solar panels and installed at a location for approximately a month. You may have seen the board on Rannie Road in May and June of this year immediately following the road assumption. Rannie Road may be an ideal location for speed humps in the future. 2. Parking Enforcement: The Town of Newmarkets parking enforcement team is responsible for enforcing parking standards on public road allowances. Enforcement of parking regulations supports improved road safety, traffic flow, accessibility, and assists the town in managing its road infrastructure for street sweeping, and snow clearing. Any vehicles found in violation of the Parking By-law 1993-62** may be issued a ticket and /or towed at the owner's expense. Parking fines range from $20 to $300. The parking sign locations on Rannie Road and Ritas Avenue have been marked by a stake and will be installed by the end of July of this year. I have attached a drawing in red to explain where the no parking zones will be. 3. LED Streetlights: The Town of Newmarket has a Town-wide energy savings program that saw the installation of over 7,500 LED (light-emitting diode) street light fixtures throughout Newmarket. The Town is expected to save over $300,000 in electricity costs annually while reducing service and operational costs by over $310,000 each year (including cost avoidance) as a result of the switch to LED fixtures. New LED lights replaced the existing High Pressure Sodium and Mercury Vapour fixtures, using the existing pole top or arm. Trail lights located on the Tom Taylor Trail were replaced as part of this initiative. All Town owned street lights, 7,758 in total, were upgraded to energy efficient technology. A capital project request for Rannie Roads and Ritas Avenue to convert the current light to LED has been requested in the 2019/2020 budget. 4. Bylaw Enforcement Property Standards: Both myself Planning and Engineering staff have been in contact with the developer (and have requested the Yonge/Clearmeadow corner and surrounding area be cleaned up of dumping, long grass and general abandonment of the site. We have also asked the developer to provide us with more information beyond the Secondary Plan designation for the property regarding development plans and timing for, phase 4 and 5 on Enza Court. Jane Porter Plaque Monument: The court house use to be the former site of the Industrial home. This was a place where family members were sent if they were sick, elderly, had no money/family members etc. Jane Porter donated $2,000 towards the erection of a wing, built in 1897. A plaque in her honour may have been in the wing and was later placed on the cairn when the Industrial home closed. Jane Porter died July 16, 1896. The Town recently acquired the property from the Region which the monument off Rannie Road sits on. We are currently seeking a grant funding opportunity to restore and maintain monument in order to restore it. In the coming weeks you will be able to enjoy a sign to communicate the importance of the monument within the community. Trails, Paths and Solar Lighting: Over the last two years we have been working on connecting paths and trails. The George Lusby Path and the Monument area will connect to Flanagan then continue towards the Ray Twinney Complex and beyond. We are currently seeking a grant funding opportunity to explore low impact solar lighting for these kinds of trails and paths. If we are successful we will apply these lights to the George Lusby and Jim Bond Parks and our other neighbourhood paths to improve safety and use. 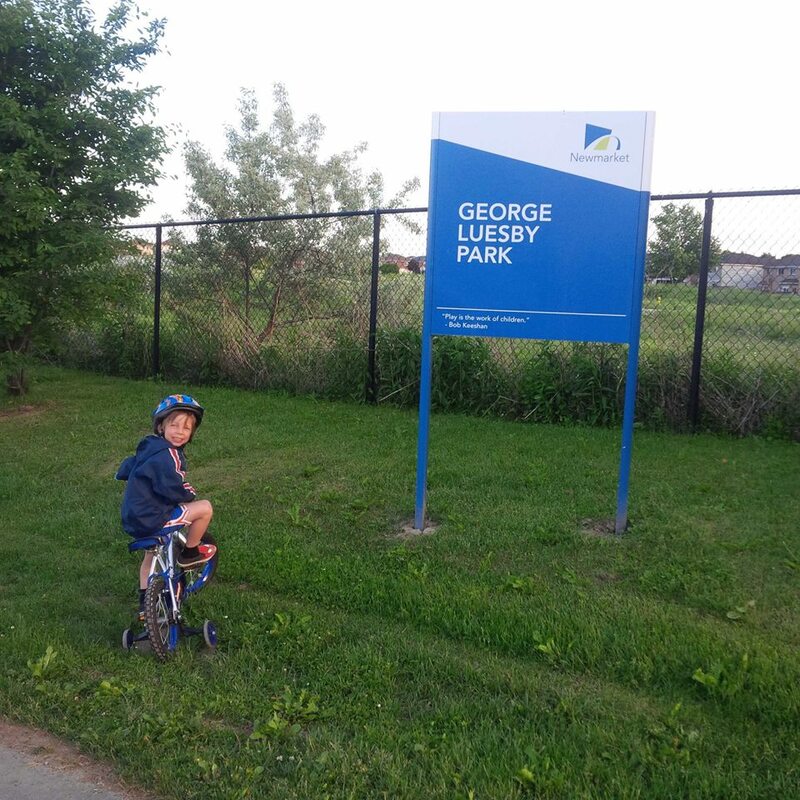 “THAT staff provide alternate trail options for this area, including the option of extending the trail through George Luesby Park along Clearmeadow Boulevard to Yonge Street and further connecting the trail from Flanagan Court/Rita’s Avenue to the George Luesby Park Trail; AND THAT staff also include in the report the option of installing lighting along the George Luesby Park Trail.” This motion was approved unanimously by the council and up again for discussion once the VivaNext construction is completed. This is necessary in order to properly asses where safe trail connectivity can occur to ensure the safe crossing of Yonge Street and access to buses. If it is decided that we DO NOT build a path behind the homes a decision will be made on the land weather is be offered to the residents to assume and/or purchase or left under the care of the Town to be kept in a naturalized state with routine inspections. This second option may include a fence to divide the property. HERITAGE AND GREEN SPACE PROTECTION AND CONSERVATION: Town of Newmarket has agreed to the purchase of the 11.6 acres of land at the north-west corner of Mulock Drive and Yonge Street, known to the community as the Mulock Farm Estate. The vision is to create an iconic community park and outdoor green space which includes land to accommodate a skating rink, walking trails and a one-kilometre skating trail throughout the site. In order to complement the existing Jim Bond Park known within our community for quiet activities including fitness groups, Mom’s on the Run local BBQ’s, and dog walking, we will ensure all possibilities are removed for visitors to park on Jordanray Blvd., Osler Court, Fadine Road and Menczel Crescent by maintaining and improving the fence that separates Jim Bond Park and the Mulock estate. For residents’ convenience, there will be pedestrian and bicycle access from Mulock Drive and Yonge Street. Finally , I would like to express my sincere thanks and appreciation for your patience in seeing the completion of our community. By working together, sharing information, ideas and being engaged in our community we can achieve results for Ward 6 together.